If your Cochrane group is looking to develop new partnerships, review existing partnerships, or even to conclude a partnership, here are some resources which may help you. Guidance includes references to additional resources (published tools and external websites). Cochrane has developed an online learning resource, Involving People, for systematic review editors and authors to support them in getting people involved in the production of reviews (including Cochrane Consumers: patients, their families and carers, as well as other members of the public; and health care teams). The resource is a 'one-stop-shop' to find out best practice and practical suggestions for finding and involving people throughout the review process. 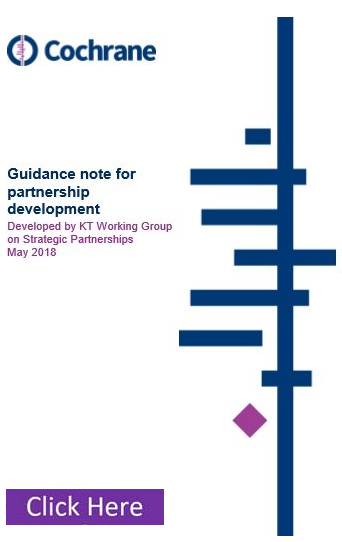 Cochrane has a Partnership Policy which provides definitions and more guidance for Cochrane Groups who are interested in working with external partners. Memorandum of Understanding (MoU) is a good way of formalising a partnership. A template has been developed for Groups to use. An alternative for formalising a partnership would be to develop a ‘Terms of Reference’ document between the two partners. Here is an example produced by Cochrane Canada. 'About Cochrane' Toolkit in our brand resources can be used when introducing potential partners to our work. Cochrane has a Conflicts of Interest Policy. It is important that any potential conflicts of interests are considered when looking at possible partnerships.